A man shot and killed his estranged wife as she sat in the parking lot of a Beltsville, Maryland, high school Thursday, Prince George's County Police said. Police are searching for 62-year-old Eulalio Tordil of Adelphi. They said he followed his estranged wife, 44-year-old Gladys Tordil, onto the property of High Point High School about 4:40 p.m. Thursday. Gladys Tordil was in the school parking lot to pick up her daughters when the suspect got out of his car and confronted her as she sat in her SUV, police said. A man who witnessed the altercation tried to intervene, Prince George's County Police Chief Hank Stawinski said at a news conference. Eulalio Tordil took out a handgun and shot the bystander in the shoulder, police said. He then turned the weapon on the woman and shot her several times, killing her, Stawinski said. The injured man was taken to a hospital and is in good condition with injuries that were not life-threatening, police said. No students were directly involved or harmed. Some may have witnessed the shooting, police said. School had been dismissed for more than an hour when the shooting occurred. Gladys Tordil was a science teacher at Parkdale High School in Riverdale, Maryland, Prince George's County Bureau Chief Tracee Wilkins reported. One student said it was her friend's mother who was killed by the gunman. Another student said she was just about to start playing in a softball game at the school when she heard the shots. "Everyone was just crying, like we didn't know what to do. We were just crying," she said. "We have a crate where we put all of our equipment. They rushed us in there and after about half an hour they moved us to a locker room and they kept us in the gym after that." Prince George's County Public Schools said students were secured inside the school after the shots were fired. Students participating in after-school activities at High Point and Dwight D. Eisenhower Middle School were placed in lockdown at 4:50 p.m., the school system said in a statement. Many parents gathered across the street from High Point waiting to hear what had happened, News4's Tracee Wilkins reports. "When situations unfold like this it takes some time even for us to know what's happening," said Kevin Maxwell, CEO of Prince George's County Public Schools. There was a large police presence at the scene and officers could be seen taping off an area outside the school. The lockdown at High Point was lifted at 6:50 p.m., PGCPS said. Students from DuVal, Oxon Hill and Suitland high schools who were participating in athletic events at High Point were taken back on buses to their schools. High Point High School is expected to open Friday. Maxwell said a crisis team will be at the school in the morning to support students and staff. Police said school security cameras captured video of the shooting. Police have not released a description of the Eulalio Tordil's vehicle that used to drive away from the scene. 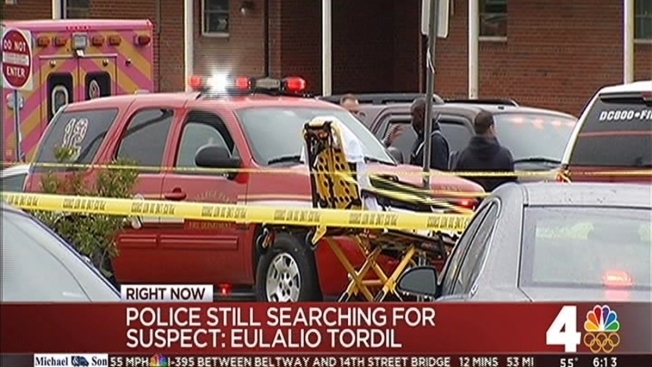 Tordil is an employee of the Federal Protective Service, police said. If you or someone you know needs help, you can call the National Domestic Violence Hotline at 800-799-7233. Prince George's County also has a special unit that responds to domestic violence crimes. Find more services and programs for individuals affected by domestic violence here.